It takes a lot of guts for a young chef to try out something that is entirely off-beat at a new restaurant and Coutinho seems to be game for such an activity with his special chicken preparation in Chettinad style. 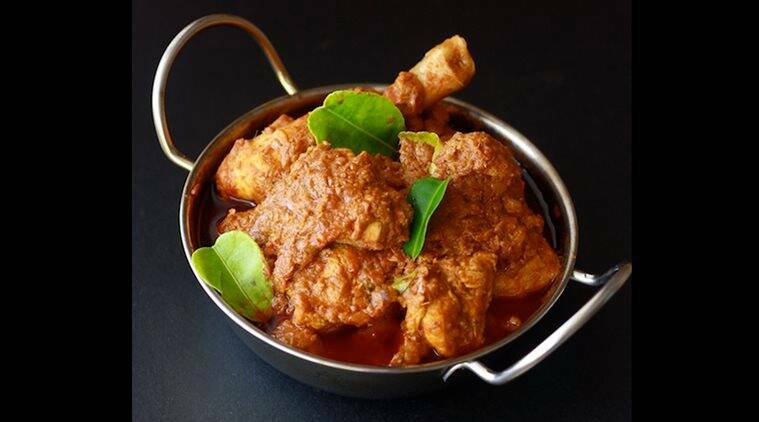 Imagine chicken meat that is black in colour and is cooked and served in Chettinad cuisine style. Well, guests at the Desi Di restaurant who order the Tamil Roast Kadaknath Chicken certainly wait in anticipation for the dish after hearing a brief introduction about the black chicken meat. “Kadaknath Chicken is an Indian breed mainly found in Madhya Pradesh. The bird is completely black — not only its plumage but also its meat, legs. Said to be rich in protein and low in cholesterol, the flavour-full black chicken meat is said to have several medicinal properties,” Chef Aaron Coutinho told IANS. By this time, Desi Di’s special red hibiscus iced tea in a tall beaker arrived at the table and it was soon followed by the “hero” of the Christmas menu that’s available till January 7 — Tamil Roast Kadaknath Chicken. The pepper chicken dish was served with two small buns along with a small cup with the pepper gravy. “We wanted to keep out all other flavours so that the guest enjoys the flavour of the black chicken meat. Nobody in our team had tasted this meat and we were sure of success,” Coutinho said. While the meat is really flavourful, the surprise element is its toughness, but after the second bite one gets used to it. “The chicken’s breast portion is similar to other country chicken but the leg meat has a strong chicken flavour,” Coutinho added. The bun also went well with the gravy but it will be better to have rice mixed with the gravy and the chicken meat to bite into. “We do market visits. Two months back we had been to a suburban market where we found the Kadaknath chicken. We tried various cooking styles with one chicken and finally arrived at this,” Coutinho said pointing to the dish on the plate. “A pair cost us around Rs 2,800 and we had to be careful,” he added. According to him, the meat is marinated for 4-6 hours. “It is a well-prepared dish. The flavour was excellent and the masala was also perfect,” Yogita Uchil, a guest at the restaurant, told IANS. “After hearing Coutinho briefing about the chicken, we were mentally tuned and ready to see black meat chicken on our table,” added her husband Harsha Raj, an IT consultant. Desi Di’s Christmas special menu also includes Goan Turkey cafreal with Tossed Potatoes and Gongura Fish/Prawn Moilee with Appam. Uchil, a foodie, pointed out that the Mizoram Super Spicy Beef and Bamboo Shoot curry with Sticky Rice were awesome. For the sweet tooth, there’s Bebinca with orange sauce or slice of plum cake.